A beautifully illuminated Christmas tree adorns the grounds of the Landratsamt in Neustift, Freising in Bavaria, Germany during a cold winter day after snowfall. Illuminated with thousands of lights reflecting off a plethora of ornaments, tinsel, and surrounding snow, this towering pine is transformed into an elegant Christmas tree, setting the holiday evening aglow outside the Landratsamt in Neustift, Freising, Bavaria, Germany. Surrounding the mighty Christmas tree is the frozen winter landscape of this historic square located in the city of Freising. Captured after dark and blanketed in fresh snow and shimmering ice, it provides a beautiful backdrop for this picture of the quintessential holiday majesty found in Germany. winter snow landscape of Freising, Bavaria, Germany. Today, lights for Christmas trees come in all sizes and colors, steady and blinking. 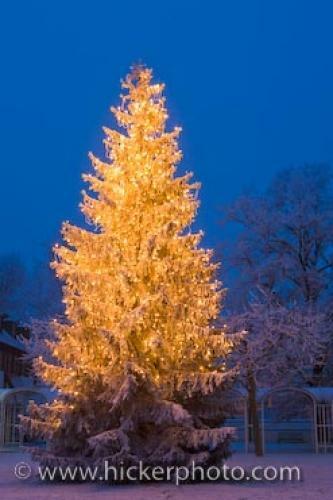 Outdoor trees nowadays are decorated with large, specially manufactured weatherproof lights that fair well against the harsh winter snow and wet elements. As in the case of the glorious Christmas tree in this picture, often one hue is chosen to create a strong artistic impact. The custom of decorating living trees in public squares also originated in Germany. The fir trees are strategically planted and grown specifically for this purpose. Since the Christmas tree is the focal point of the holiday decor and traditions, the outdoor trees not only brighten up the snow-covered winter nights, they also help to create a sense of unity in the community and an overall sense of goodwill and cheer among all who stand in the glow of its beauty. I photographed this photo with the digital SLR camera model Canon EOS-1Ds Mark III, aperture of f/11.0, exposure time of 5/1 sec. on ISO 50, as always I used a original Canon Lens, the focus lenght for this picture was 43mm.